The Dundee Canadians :: Great War Dundee - This is the story of the 30,490 men that left Dundee to fight in the First World War and of the people left at home. As you browse through the Dundee Roll of Honour you may observe many entries to men who served with armies from what were known at the time as Dominions of the British Empire, Countries such as Australia and New Zealand, South Africa and Canada. The largest number of these Dominion Soldiers within the original Roll of Honour is recorded as having served with the various branches of the Canadian Expeditionary Force. The original Roll of Honour listed 135 men either originally from or with a strong connection to Dundee, who on hearing their Mother Countries call, enlisted with many paying the ultimate sacrifice. In fact research would indicate that approx 2,120 men from Dundee enlisted with the Canadian Expeditionary Force, with approx 345 of these paying the ultimate sacrifice. Dundee’s only V.C. winner, Lieutenant Hugh McKenzie, was one of these “Canadians”. 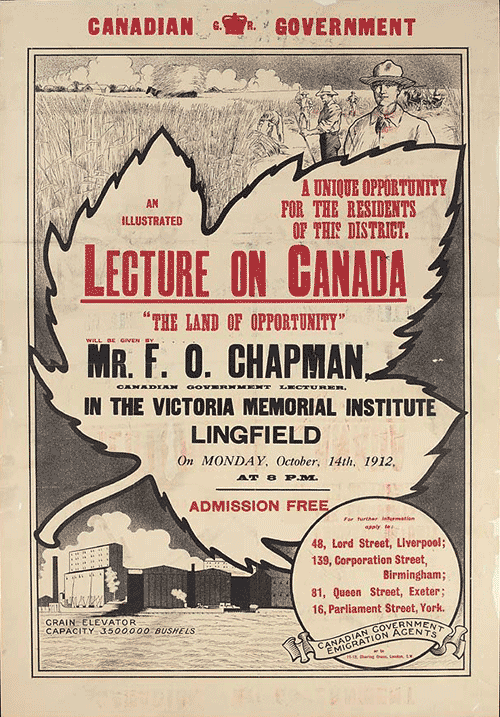 Typical poster advertising a lecture on October 14, 1912 to encourage British emigration to Canada. Source: Library and Archives Canada. These men would have originally left Dundee either as young children with their parents or as single or married men themselves and emigrated to Canada looking for a new life that offered plentiful jobs, with better wages and living conditions, with a chance of better opportunities and adventure. Life in Dundee during the late 19th and early 20th Century was very hard. Jobs were scarce and where jobs were available these were usually low paid. Dundee was a city where it was cheaper to employ women and young children than adult men. Dundee at that time, like many other towns and cities across Scotland, was very overcrowded, with poor quality housing and living conditions. Canada at this time was expanding and actively looking to expand and grow its economy. A plan was formed by its Governments Minister for the Interior Sir Clifford Sifton who decided that Canada needed more immigrants. Emigration offices were set up in several countries; they sent emigration agents around the world to encourage immigration, there job was to show Canada as a very prosperous nation with many opportunities for people who were willing to work hard. The Canadian Government also provided many incentives for people willing to settle in the Western Provinces and start farming, such as free or assisted passage to Canada, 160 acres of free farmland and free supplies to new immigrants upon their arrival in Canada. The Sifton campaign was very successful, as Canada experienced unprecedented population growth by 1911. In only 10 years her population increased from approx 5,400,000 to over 7,200,000, due for the most part to immigration. According to emigration statistics published in 1912 some 10,000 Dundonians elected to move to British colonies between 1906 and 1911 and of that total it was calculated that some 45% settled in Canada. With the potential opportunities and possibilities for a better life it is understandable why so many left Dundee and other areas of Scotland at this time looking for a new and better life. The Great War Dundee Project thanks Gary Thomson for this article and for his research and valuable contribution to the Dundee Roll of Honour database.